1st Oatley Bay Scouts and Oatley Guides work together to present a fun annual Market Day in June each year. Going from strength to strength, the Market Day is a fantastic community event loved by locals of Oatley and surrounding suburbs. thanks to some of our past Sponsors! Banish the winter gloom with a great day out! Join us each June as we create a real party atmosphere in the heart of Oatley with something for everyone. The legendary Trash & Treasure sale will be held in the Guide Hall where many a fantastic bargain will be found. Outside there will be a huge array of market stalls selling a wide variety of handmade and exotic items. The famous Scout BBQ will be selling hot, hearty food alongside the coffee stall, lollies, snowcones and lots of other delicious treats. Kids will enjoy the funfair rides of all descriptions. Don't miss this much-loved annual event! This event is the major fundraiser of the year for the Oatley Sea Scouts and Guides. Run entirely by volunteers, Scouting has a long and cherished history in the local area. All fundraising efforts help towards providing safe, high quality activities that develop the skills and independence of local children. Funds raised cover hall maintenance, repairs to boats and purchase of camping and boating equipment for use by the children. Neville St, Oatley (between Oatley Avenue and Oatley Parade) is closed to traffic to cater for this event. 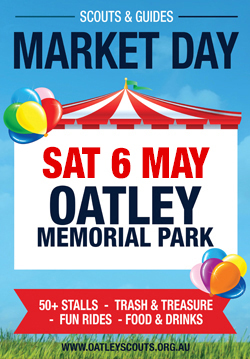 Stalls are located in Neville St and the southern end of Oatley Memorial Park. Stallholder sites are available for $65.00 per stall (pre-payment required). Bring your own cover and tables, site sizes are 3m x 3m. All sites are unpowered. Stall locations are allocated on basis of stall type and first in. To book a site, download and complete this booking form and with your payment to either oatleymarketday@gmail.com or to Oatley Market Day, c/- 1st Oatley Scouts, PO Box 4, Oatley NSW 2223. For enquiries, please email oatleymarketday@gmail.com. Cheque payments should be made payable to 1st Oatley Bay Scouts. 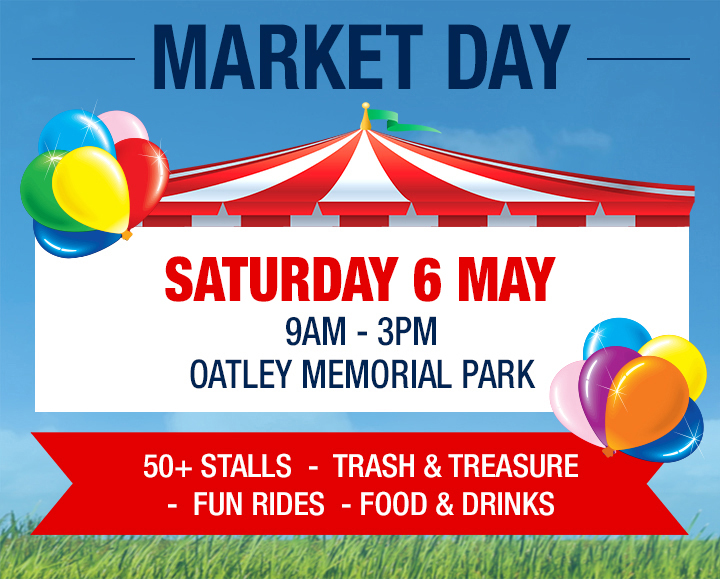 The Oatley Guides are joining us in organising the Market Day this year and will be running the Trash & Treasure stall. All donations of trash and treasure (except electrical goods) are gratefully accepted! For enquiries about donating trash and treasure, please call 9580 4751.